There are hundreds of mutations within the beta globin gene, but approximately 20 different alleles comprise 80% of the mutations found world wide. Within each geographic population there are unique mutations. Individuals who have beta thalassemia major are usually homozygous for one of the common mutations, or heterozygous for one of the common mutations and one of the geographically-unique mutations. Both lead to absence of beta globin chain production. The beta thalassemia syndromes are much more diverse than the alpha thalassemia syndromes due to the diversity of the mutations that produce the defects in the beta globin gene. Unlike the deletions that constitute most of the alpha thalassemia syndromes, beta thalassemias are caused by mutations on chromosome 11 that affect all aspects of beta globin production: transcription, translation, and the stability of the beta globin product. Most hematologists feel there are three general categories of beta thalassemia: beta thalassemia trait, beta thalassemia intermedia and beta thalassemia major. Splice site mutations also occur and are of clinical consequence, when combined with a thalassemia mutation. Three splice site mutations occur in exon 1 of the beta globin gene. These mutations result in three different abnormal hemoglobins: Malay, E, and Knossos. Hemoglobin E is a very common abnormal hemoglobin in the Southeast Asian population, and when paired with a b0 thalassemia mutation, can produce severe transfusion-dependent (Eb0) thalassemia. Hemoglobin E is described in the section on variant hemoglobins. Individuals who have Beta thalassemia trait have microcytosis and hypochromia; there may be targetting, elliptocytosis, though some individuals have an almost normal smear. Hemoglobins A2 and F will be elevated on hemogram results. These hematologic features can be accentuated in women with trait who are pregnant and in individuals who are folate or iron deficient. If iron deficiency is concurrent with beta thalassemia trait there may be a normal Hgb A2. Iron deficiency causes decreased hemoglobin production, and folate or vitamin B12 deficiency can lead to megaloblastic anemia with increased Hgb A2. Both of these deficiencies need to treated prior to evaluation for thalassemia trait. In iron, B12, and folate replete individuals, the Hgb A2 can be as high as 3.5 to 8% and the Hgb F as high as 1 to 5%. Generally, beta thalassemia trait is milder in African-Americans (who frequently have a promoter gene mutation) but has a similar presentation in individuals of Chinese, Southeast Asian, Greek, Italian, and Middle Eastern heritage. Infants born in 42 of the 50 states in the United States with newborn screening programs will be diagnosed as having a hemoglobin disorder. In states without newborn screening for hemoglobinopathies and in recent immigrants to this country, affected children are frequently identified outside the newborn period, and the evaluation of their microcytic anemia includes differentiation between iron deficiency and beta thalassemia trait. The red blood cell indices can be helpful in this differentiation, as the hemoglobin concentration and the red cell count will generally be lower in iron deficiency. The distinguishing finding in beta thalassemia is a hemoglobin electrophoresis with the finding of elevated Hgb A2 and F. Both will be increased in beta thalassemia trait without iron deficiency, and will be normal or decreased in alpha thalassemia and isolated iron deficiency anemia. There are several formulas to help in office screening, but they are also based on the assumption that the child is not iron deficient. Usually iron deficiency can be ruled out using free erythrocyte protoporphyrin (FEP), transferrin saturation or ferritin as a screening test in children who have a hypochromic microcytic anemia. The least expensive test is a trial of iron and a repeated hemogram after a month. A lead level should be obtained if there is an index of suspicion for lead toxicity. Diagnostic challenges can still arise: if both alpha and beta thalassemia coexist, the changes in Hgb A2 and F will not be apparent, and as noted above, there are instances of normal or elevated levels of Hgb A2 and F in beta thalassemia trait. Family studies and, if warranted, DNA analysis can be used to make a definitive diagnosis. Children who are diagnosed with Thalassemia Intermedia have a homozygous or heterozygous beta globin mutation that causes a decrease in beta chain production, but not to the degree that chronic transfusion therapy is required. The phenotype can also occur in children who have a mutation that increases production of c-globin, in children who have co-inherited alpha thalassemia and beta thalassemia, and in other rarer mutations. Children who have thalassemia intermedia are able to maintain a hemoglobin of 7 gm/dl or slightly higher with a greatly expanded erythron and may manifest bony deformities, pathologic fractures and growth retardation. Children who have thalassemia intermedia can also have delayed pubescence, exercise intolerance, leg ulcers, inflammatory arthritis and extramedullary hematopoiesis causing spinal cord compression, a medical emergency requiring radiation therapy and transfusion. They can also have iron overload due to increased absorption of iron from the gastrointestinal tract and intermittent transfusion. They are at risk for the cardiac and endocrine complications of hemosiderosis, but usually at an older age than chronically transfused children. Chelation therapy is indicated for increasing ferritin and elevated liver iron. Children who can not maintain a hemoglobin between 6 and 7 gm/dl should have an alternative diagnosis considered. If thalassemia is the cause of the anemia, transfusion and/or splenectomy should be considered. 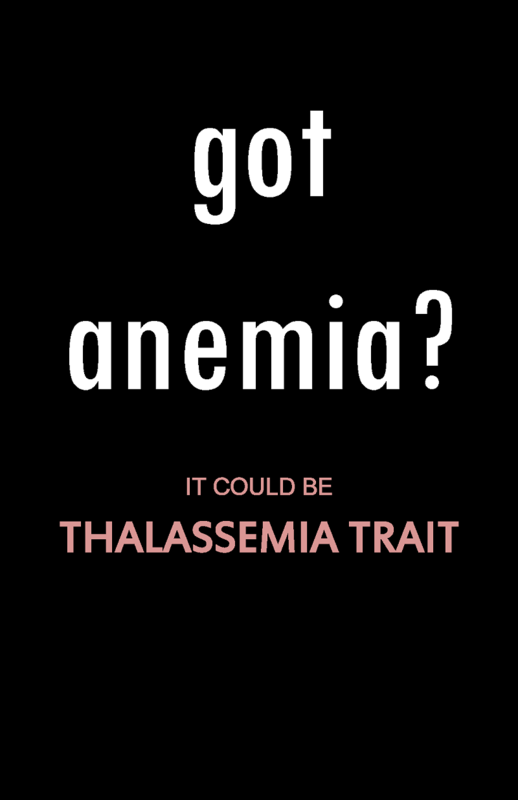 Frequently, adolescents and adults are unable to tolerate the degree of anemia that is seen in thalassemia intermedia. Hypersplenism, splenic pain, congestive heart failure secondary to anemia, severe exercise	intolerance, thrombocytopenia and leukopenia should be considered indications for beginning transfusion therapy or for splenectomy in the child who has severe hemolytic anemia. Beta thalassemia major was first described by a Detroit pediatrician, Thomas Cooley, in 1925. The clinical picture he described is prevalent today in countries without the necessary resources to provide patients with chronic transfusions and desferoxamine therapy. Children who have untreated thalassemia major have ineffective erythropoiesis, decreased red cell deformability, and enhanced clearance of defective red cells by macrophages (immune system cells). The result is a very hypermetabolic bone marrow with thrombocytosis, leukocytosis and microcytic anemia in the young child prior to the enlargement of their spleen. At presentation they have almost 100% percent Hgb F (these cells have a longer life span due to a balanced globin ratio, as c rather than b, globin is present Hgb F). These children have little or no Hgb A2 and a low reticulocyte count. The diagnosis can be confirmed by demonstrating thalassemia trait in both parents, by globin biosynthetic ratios, or by beta gene screening. Beta gene screening identifies the most common and some uncommon mutations, but not all mutations. An electrophoresis showing only Hgb F, a complete blood count and a smear will generally be diagnostic. In most states, these children will be discovered by state screening or occasionally by the obstetrician who makes a diagnosis of thalassemia trait in the mother and obtains a family history of thalassemia or anemia in both parents prior to the birth of the baby. Children who have untreated thalassemia generally die in the first decade of life from anemia and septicemia, and may suffer from pathologic fractures. When palliative transfusions are introduced, children live into their late teens, but eventually succumb to heart failure if iron overload is not treated. But with the introduction of frequent chronic transfusion and the use of chelation therapy, many patients who are compliant with chelation are entering their 50th decade and later. However, those not compliant will have a much shortened lifespan. Bone marrow transplantation has the potential for a permanent cure, though there are significant risks. Listed below is common terminology that you may find in textbooks which describe beta thalassemia. Beta thalassemia disorders result from decreased production of beta globin chains, resulting in relative excess of alpha globin chains. The degree of excess nonfunctional alpha chains is the major predictor of disease severity. Beta-0 thalassemia refers to the absence of production of beta globin. When patients are homozygous for a beta0 thalassemia gene, they cannot make any normal beta chains (hemoglobin A). Beta + thalassemia indicates a mutation that presents decreased but not absent production of beta globin. Thalassemia patients in which one or both of their beta thalassemia mutations are beta+ mutations make some hemoglobin A, and the disorder may be less severe. 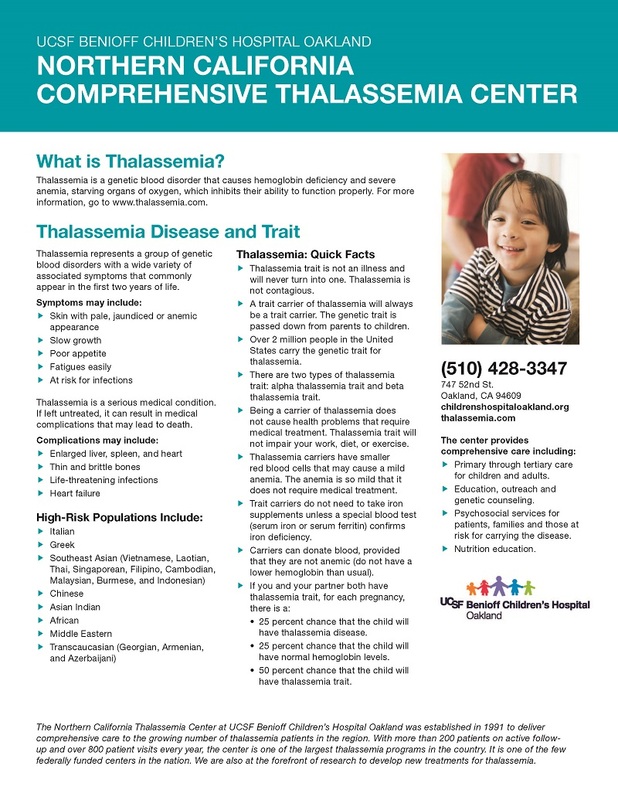 Thalassemia trait, also called thalassemia minor, is when a person carries the trait for thalassemia major – there is no clinical significance when a person carries the trait. Beta thalassemia major is a clinical diagnosis referring to a patient who has a severe form of the disease and requires chronic transfusions early in life. Beta thalassemia intermedia is a clinical diagnosis of a patient characterized by a less severe chronic anemia and a more variable clinical phenotype.